vbac or bust: Let the VBAC Journey Begin! Stories of healing, post partum depression, preparing for my VBAC, and hopefully preventing someone from going through the same thing I did. Let the VBAC Journey Begin! Let the journey truly begin! After over a year of planning, studying, and preparing, we now get to put it all into action. 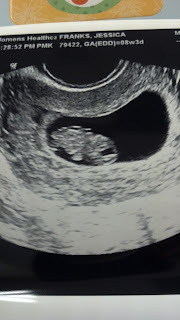 We are pregnant with baby number 2. (We really do need a better nickname than #2) Our babies "ETA" is April 7th 2012. Don't worry, we will be finding out what we are having, we're not patient enough for that. 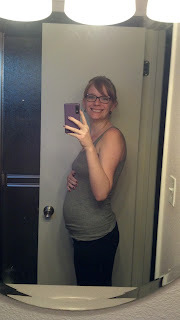 So far, this pregnancy has been fairly uneventful. Headaches, heartburn, and fatigue are the common symptoms at this point. But, as we say good bye to the first trimester, and head into the second, hopefully I'll get some energy back. Emotionally, its been a mini roller coaster. I have ups and downs, and even went through a little bit of depression early on. I even contemplated a repeat c-section (gasp!) Thankfully, my husband always brings me back down to reality :) The ICAN meetings help too. I have found a new strength in myself, and am hoping I can keep in touch with that throughout the entire pregnancy. We are planning a natural, drug free birth in a hospital. We will enlist the help of a doula to be a part of our support team. I am walking a few times a week, doing yoga at home, and watching what I eat. All things I did not do last time. So far I have gained 1 lb. With my first, I had already gained 12 lbs at this point. Don't worry, I'm eating, and even indulging at times. I had cake with breakfast yesterday, just not FOR breakfast. I will thank you all in advance for your support on our journey, because we're only taking positive words from here on out. Good luck Franks family! I'm rooting for you all the way and can't wait to read about your experiences along the way! Congratulations!! That is awesome and I'm so excited for you and your journey - praying for a successful VBAC! Well, I see it's not a secret anymore....so I can say, congratulations!! I hope things go your way Jesse. I know you are very prepared. My thoughts are with you. congratulations!! I'm so happy for you!!! yay! congrats!!! ill be following you on your journey, let me know if you ever need to talk! Many congrats! Good luck on your journey!